With an integrated design, beauty and functionality the Aston SD908 semi-frameless 40 in. x 40 in. x 77.5 in. round bypass sliding door shower enclosure with matching base is the ideal shower solution. The final touches on this model will complement any renovation - traditional or contemporary. With features including 5mm ANSI-certified premium clear glass, either chrome or stainless steel finish hardware and magnetized door channels, this enclosure potrays beauty and functionality on a budget. This model includes the matching 2.5 in. low-profile acrylic base. Establish a brand new look for your bathroom with the Aston Moselle 48 in. x 35 in. x 77.5 in. Completely Frameless Sliding Shower Door Enclosure with matching 2.5 in acrylic low-profile right drain base. With the Moselle completely frameless sliding door shower enclosure, you can achieve a luxurious showering experience in a corner space. Accentuated with either chrome or stainless steel finished hardware, premium 10mm ANSI-certified tempered glass and deluxe full-length clear seal strips to prevent leakage, this European-inspired door will add both luxury and functionality to your bath instantly. 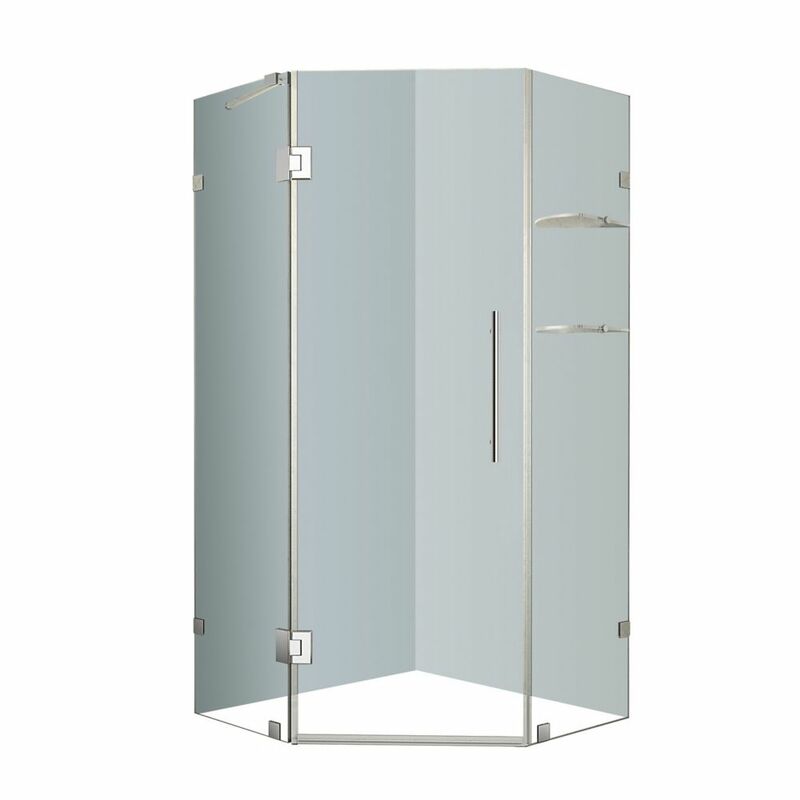 Neoscape 38-Inch x 38-Inch x 72-Inch Frameless Shower Stall with Glass Shelves in Chrome Add a desirable contemporary style to your corner shower allotment with the Aston Neoscape GS completely frameless neo-angle shower enclosure with two-tier glass shelving. Available in a number of width and length sizes - from 34 in. to 42 in. - the Neoscape GS will instantly upgrade your bath. All models feature 10mm ANSI-certified clear tempered glass, stainless steel or chrome finish hardware, self-centering hinges,premium leak-seal clear strips and its reversably enginered for left or right hand installation. The GS class includes a two-tier glass shelving storage system, to complete your new showering experience. All models come with a 5 year warranty, standard; base not included.